When a programming language is chosen for a project, several factors are taken into account, like the programmer's experience with certain languages or the needs of the application that is being designed. This is why when a language must be changed, we need an application like ASP 2 VB Converter. This small program can convert as many ASP code files as necessary to a single Visual Basic 6.0 project, something that makes compiling in an ActiveX COM DLL much easier. Thanks to programs like this, converting any development carried out in the versatile ASP language to Visual Basic will be really easy, so we'll be able to enjoy the advantages offered by this language in any application's development. 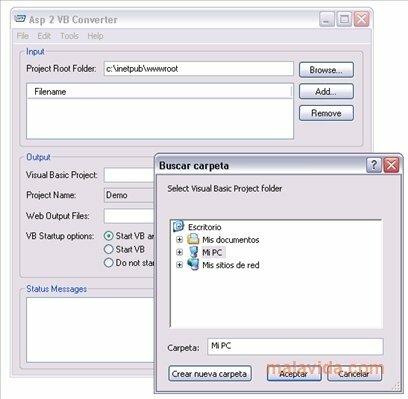 ASP 2 VB Converter requires several development environments and servers that are somewhat specific due to the fact that converting between programing languages isn't at all easy, that is why it is highly advisable to run thorough testing on the resulting file. It is necessary to have Visual Basic 6.0 or above and Microsoft IIS. This download doesn't work on Windows 7. The download requires a ZIP compatible compressor.